This is Row 5, Similar to Row 3. I am using a vintage size 80 thread. The current size is 4 inches or 10 cm. 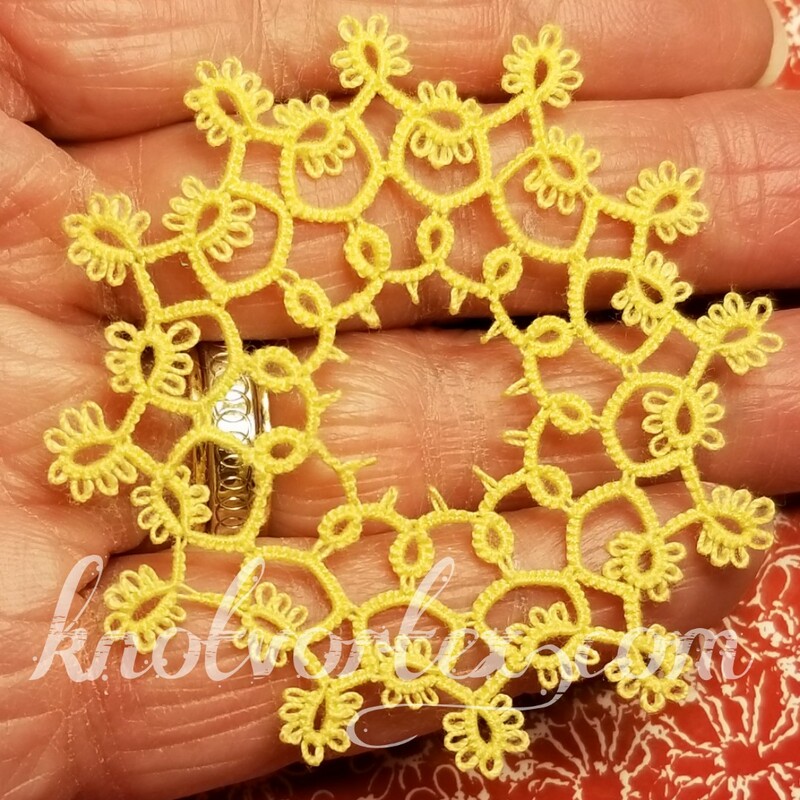 No blocking but it has a slight frill. 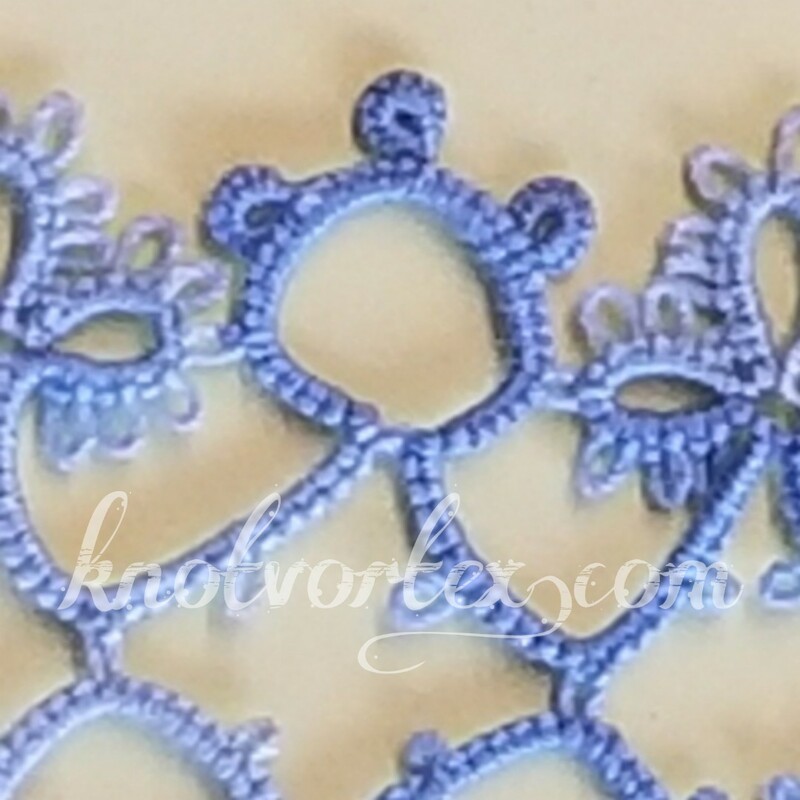 The pattern can be found on Renata Niemczyk (aka Renulek) blog called "Frywolitki, Tatting, Chiacchierino" . 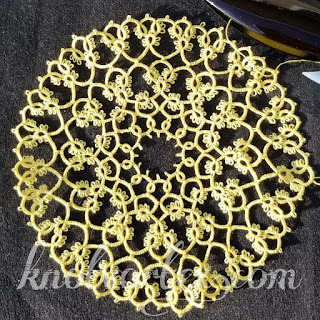 The completed doily pattern is also available from her Etsy shop. Here you go, rows 3 and 4. I am using a vintage size 80 thread. The current size is 3.5 inches or 9 cm. No blocking required on these two rows. Renata Niemczyk (aka Renulek) has done it again. Here are the first two rows of her Wiosna 2019, Spring Doily. 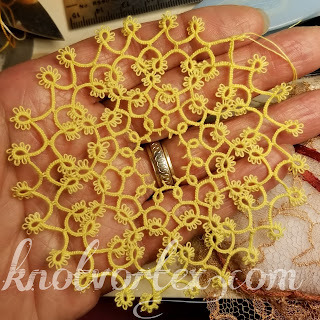 Check her blog called "Frywolitki, Tatting, Chiacchierino" every Thursday for the next few weeks to see a new round or two. 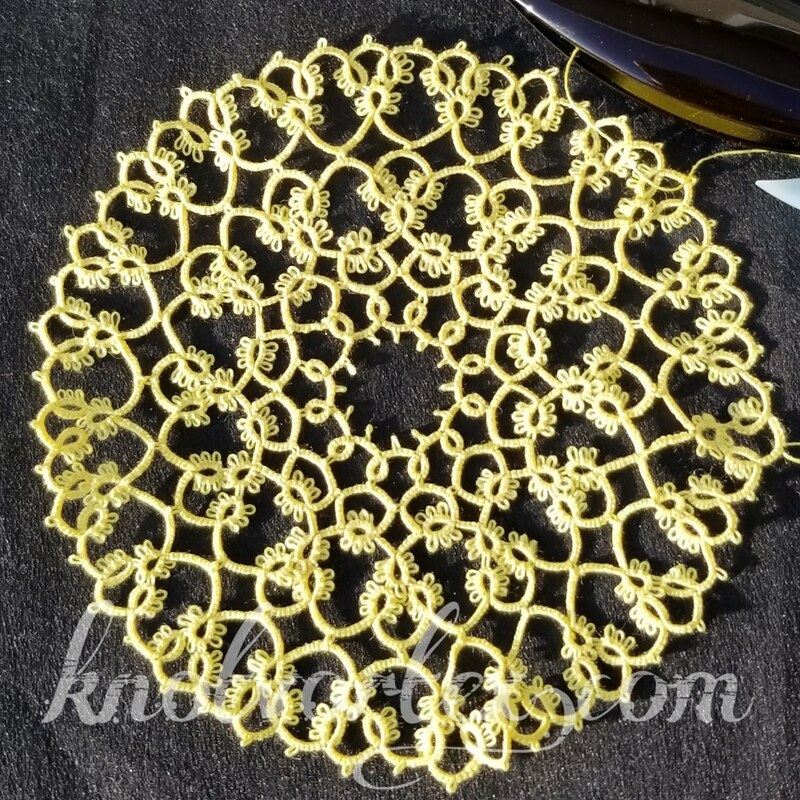 Renata has also made the completed doily pattern available from her Etsy shop. 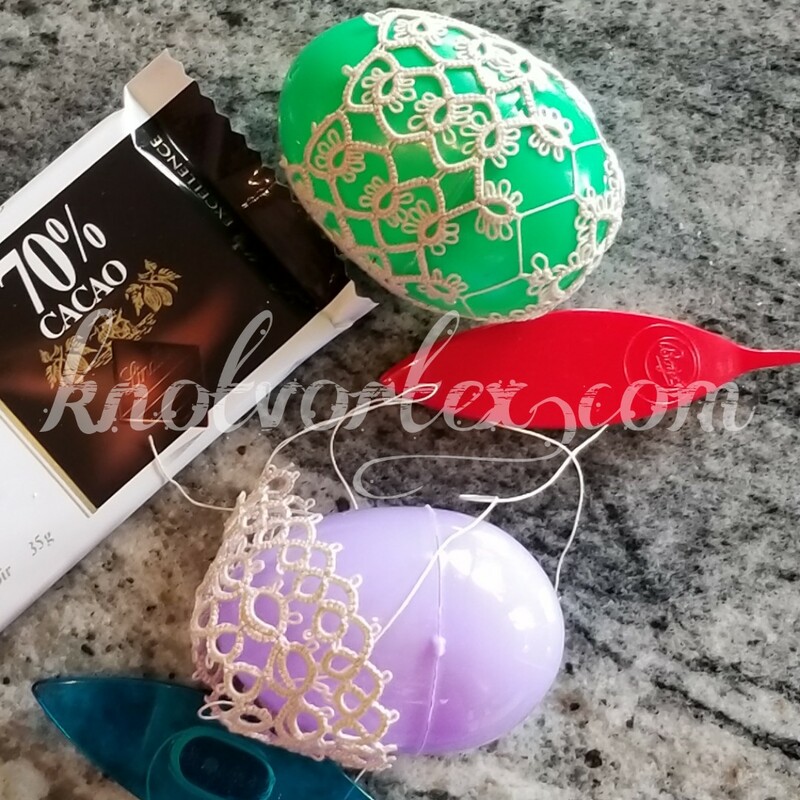 I have started using a vintage size 80 thread with plans to add more colors later. 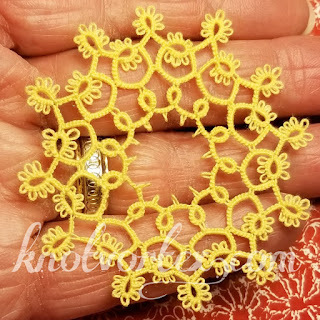 I am not entirely happy with my tatting but blocking has corrected a few loose chains. You may recognize this cross by Ben Fikkert, the pattern can be found on his website here. I've made it once before but didn't get a chance to block it before my sister claimed it. The cross is done in a vintage size 80 thread, less than half a ball. The size is 10 x 15 cm or 4 x 6 inches. I have also added a picture of a close up on the SCMR and Josephine rings. 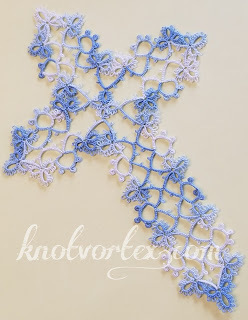 It was a cross like this that a coworker brought to the office that rekindled my tatting. I hope someday this cross may do the same for another. But before that happens it will be one of the samples that will be in a demo with a local guild next month. No.Am. Cover for 2012's SYTYCW Entry! Contact bolin434 at gmail.com Copyright 2013 to present, all rights reserved. Simple theme. Theme images by merrymoonmary. Powered by Blogger.